100 (One order is for 100 plants)-1/2 gallon size (Small handful size divisions) bare root to semi bare root feild grown plants. Expect growth of 6-8' in height, 1' in widtth the first year, though plants will appear sparce.-Miscanthus Giganteus sometimes spelled Gigantus. Actual variety is Illinois strain of Miscanthus x Giganteus ( Giant Silver Reed Grass, Floridus) Zone 4-9. 12-14 foot tall ornamental grass. Leaves grow up and gracefully cascade outward. Showy spikelets form a needle like silvery-white awn in autumn. Very ornamental, lasting through the winter. Makes great hedges, blinds, and wildlife habitat. Grows well in average soils in full sun, with moist but well drained soil. Very popular with outdoorman, this grass makes a great cover crop, wildlife habitat and bedding. Used as bedding it lasts much longer than straw and is useful on the farm as well. This is the grass being used as a biofuel crop. 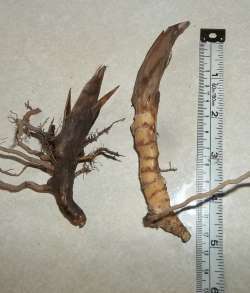 A sterile plant, not grown from seed, but only from rhizome divisions. To see more information about this grass click on the information links on our home page. If interested in larger quantities please contact us for availability and to order. Quantity discounts offered see miscanthus on the home page for details or call (517) 726-0026 for pricing and availability.